Sometimes beggars can’t be choosers. Especially runners who miss race registrations. The popularity of running road races has risen exponentially in Malaysia in the last year or so and I have learned that to delay registering for a race these days (especially a major brand name one) meant losing your chance to participate. This was what happened to me for the Malaysian leg of Adidas King of the Road (AKOTR) 2012. Only a month after it opened for registration, the 10,000 slots allocated were all taken up, and yours truly did not get sign up in time because I kept putting it off. And so I accepted my fate that I was not to run AKOTR this year. That was until I encountered a lady runner on Twitter who informed me that she had to stop running till the end of the year due to an injury. As she listed out all the races that she had already paid for but could not join (she was already signed up till January 2013! ), my heart jumped when I saw her mention AKOTR. Grabbing the opportunity, I hastily asked her if she would mind letting me buy her race bib and run in her place. To my delight she agreed! About 2 weeks after that fateful online exchange, I agreed to meet with Lotfi, the kind lady, who not only gave me her entire race kit for absolutely nothing, but she also treated me to dinner – which just goes to show that sometimes the kindest of deeds come from the unlikeliest of strangers. But before I agreed to take strangers’ bibs, I did wonder about the ethics of running with someone else’s identity during an official race. Would the race marshal check my identity? What happens if there is an emergency and someone has to flip my bib over to locate my emergency contact and later find out it is not who it’s supposed to be? And does it matter if you were a woman running with a veteran man’s bib? I asked. Apparently it does not, there are always runners out there at events who have taken advantage of bibs bought, traded or freely obtained from online forums, runner clubs and so on – bearing different gender categories and names not of their own. There are a few benefits to running with another person’s race bib. For one, the fee that originally paid for the bib is not wasted (the person may have had to cancel attending the race due to other commitments or circumstances). And secondly, it sure beats running as a non-paying bandit! As for the racer’s name and emergency contact that are already printed on the back of the original racer’s bib? Scratch it out with a marker and write down your own details – problem solved! 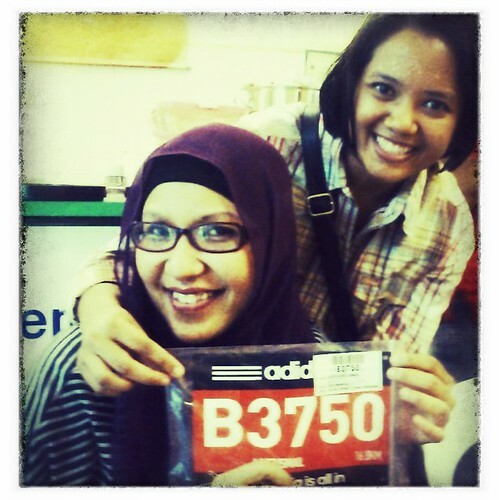 And so I happily ran with another fellow runner’s bib and vest come race day at AKOTR Malaysia, with my heart set on enjoying the race – and praying for a speedy recovery for her who made it possible for me to join the event in the first place. i definitely agreed on your first point. i missed out AKOTR, then the Nike We Run Kl, but that was outrageous. all slot finished in just 4 hours. and i have my exam that time. anyhow, im glad i found this blog. so inspiring like other’s runneers blog. keep up with the good post! Faisal: I will let you know. You can also try Chap Ayam Runners page, sometimes people let go of bibs there.